"This is a very old recipe for egg custard. If you like cooking vintage recipes for a taste of the old life, this one is for you. You can also convert this recipe to make tarts or a pie. You can add nutmeg and other spices to taste, or you can bake a pie crust and pour custard into that as well." Whisk eggs and sugar together in a large pot. Gradually add milk, whisking constantly. Stir in vanilla. Heat milk mixture over low heat, stirring constantly. Cook, stirring occasionally, until mixture thickens and coats the back of a wooden spoon, about 30 minutes. Pour into a serving dish and allow to cool. Salty, sweet, soft and smooth, Chef John's custard is delight in its purest form. Take that Jello! 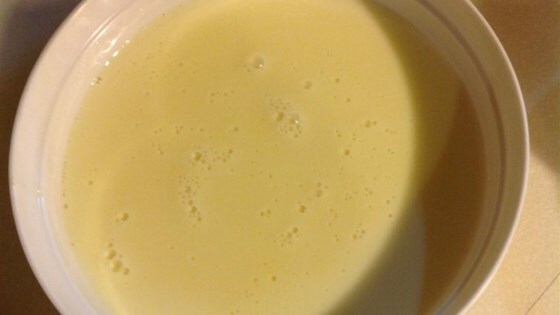 I have searched for years for an egg custard recipe that tastes like Jello's Americana egg custard. This is best one so far. Had a wonderful flavor but it was too thin. I could not get it to thicken. Since this recipe has such a low ratio of eggs to milk, the custard really doesn't set as a solid. It combines with fruit & jams really well. This recipe did not work at all for me. I feel like a step or some instruction of some sort was missing. It never thickened for me.